There are some walks that I never tire of walking. And this is one of them. A short uphill walk from Zermatt leads to a balcony walk – a traverse – a couple of hundred feet above the village. It’s maybe only a mile or so in length and at it’s far end it drops back down through Winkelmatten at the top end of the village. A nice way to spend a quiet afternoon. It’s all that a forest walk should be: a peaceful stroll, away from the crowds, and taken at a leisurely pace. I came across a quote yesterday from the American country singer, Carrie Underwood: ‘Don’t forget to stop and smell the roses.’ I know exactly what she means. There were plenty of stops along this walk, and plenty of ‘roses’. 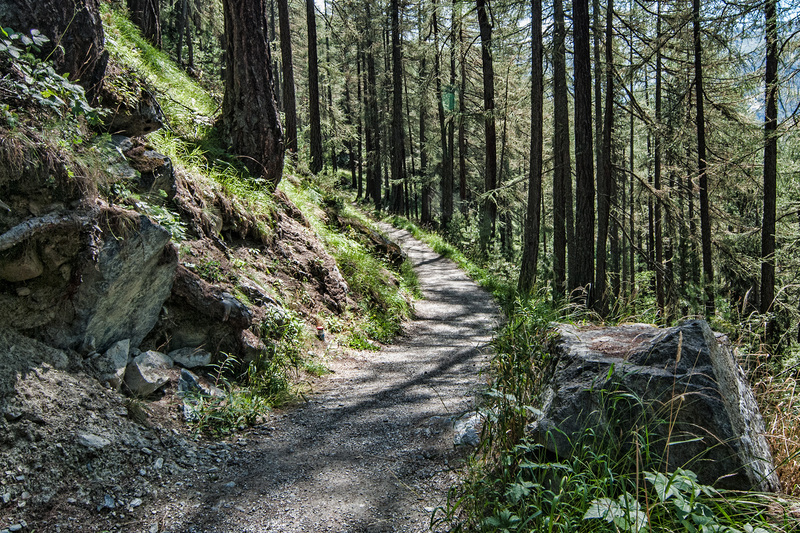 This entry was posted in Swiss Alps - Summer and tagged Forest, Valley walks, Zermatt. Bookmark the permalink. That’s a beautifully inviting trail….. It is, Scott. Short but a great pleasure. Oh I wanna be there too…you make it look irresistible. There are roses everywhere, but they always are better on a path like this. It’s terrifically inviting. Looks enchanting – my kind of place. ….and I need no beckoning to take time to smell the roses – they are everywhere I look. Life’s all about choice and the wise always keep a little part of each day to inhale a rose’s perfume.